We use Dental Implants to mimic the look and function of a natural tooth. Involves the placement of the implants into the available jaw bone by drilling into the prepared site so that an implant can be accepted. The threaded implant is screwed into the prepared site and then stitched over, this is carried out with local anaesthesia; and left under the gum for 3 – 6 months. During this time the implant fuse to the jawbone and becomes osseo(bone) integrated. After the appropriate healing time, we uncover the implant and it is used to replace one or more missing teeth by fabricating a dental prosthesis (eg crown or bridge) Every attempt is made to insure the success of the implant. The dental surgery and equipment is thoroughly sterilised and the most modern techniques utilised. Involves the uncovering of the implants after they have integrated (fused). This can be accomplished with minor gum surgery and is a relatively minor procedure (compared to stage one). The abutment is then fitted; this is the connecter that attaches the implant with the crown. After a few more weeks we will check that the implant is strong enough and if so, the artificial crown is attached. Some postoperative discomfort is noticed after all 3 stages, with stage one similar to discomfort experienced after a tooth extraction. You will be given the appropriate antibiotics and analgesics just as a precaution. Very precise post-operative instructions will be given to you at the time of surgery. In some cases stages 1 & 2 are combined in one surgical procedure. If adequate primary stability is achieved a temporary crown can be placed on the newly placed implant meaning all three stages are completed in one visit (note: not all cases can be treated with this shortened approach). Dr McEwen can advise you as to the best approach for your situation. At your consultation we will discuss with you any questions that you may have as well as advising various treatment options and discussing the type and number of implants that are needed in order to fulfil your treatment objectives. If you feel that you have a lot of questions to ask us and are worried that you may forget, write them down and bring them with you to your appointment. Dental implants have been available for the past 40 years. There are significant differences, however, between the various types of implants that have been used to replace missing teeth. Osseointegrated implants, were originally developed in Sweden by Professor P.I. Branemark, Swedish Orthopaedic Surgeon 40 years ago. His first patient Mr Larsson was treated in 1965 and those implants are still there today. Nobel Biocare (formally known as Nobelpharma™) still produces the modern version of Branemark implants and is FDA approved and meets very stringent regulations here in Australia. Dr McEwen uses Branemark and other similar type implants, and has completed more than 1000 cases since 1999. There are three components to a dental implant: the implant, the titanium abutment, and the porcelain crown or bridge. Each component has a different prognosis, which is discussed below. The Implant, which has osseointegrated, has been show to have success rates of approximately 93% over 15 years. Most failures occur within the first six months of implant placement and these are generally noticed at stage 2 surgery, (Fig.3). If an implant fails to fuse with the jaw it must be removed. The bone and soft tissues repair very rapidly and it is usually possible to place another implant in the same site after allowing several months for the tissue to heal. Heavy smoking can increase the risk of failure. However in general it is extremely rare for implants to fail long term once they have integrated. 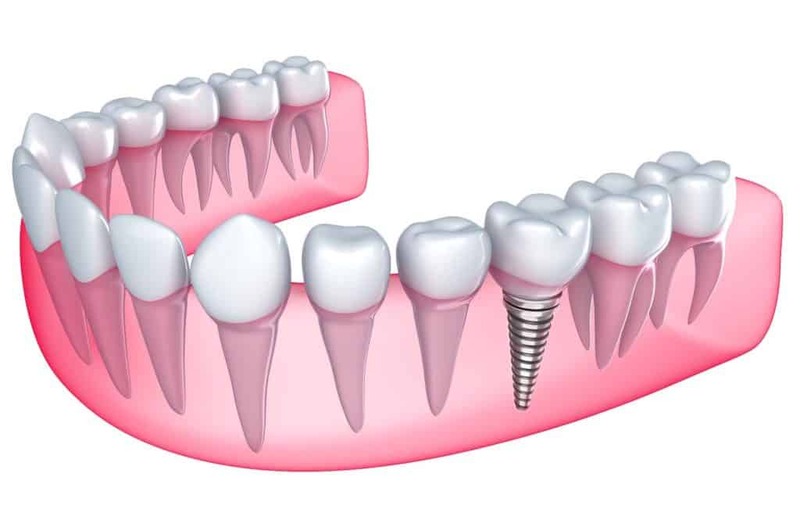 The Abutment; is secured onto the implant by means of a gold screw which should not come loose under normal conditions. However heavy loading or blows may loosen or fracture the screw, requiring replacement. The Crown; is made of porcelain which is colour stable, it is possible that after many years the crown may not match the adjacent teeth in appearance or colour. Also after many years the join between the crown and abutment may become visible, both of these cases may require crown replacement. 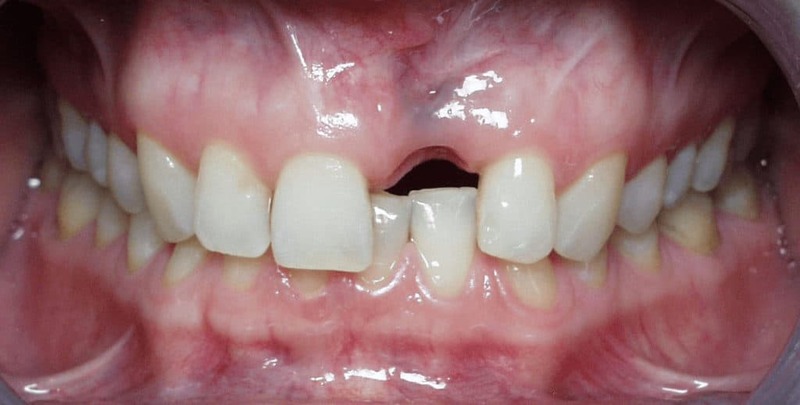 Occasionally, the cement between the crown and the abutment may fail and the crown may loosen, it is normally a relatively simple matter to re-cement the crown. Maintenance: As with any dental prosthesis, regular checkups are very important. Six months after the placement of the crown, you will be recalled so that an x-ray can be taken to evaluate the response of the surrounding bone. 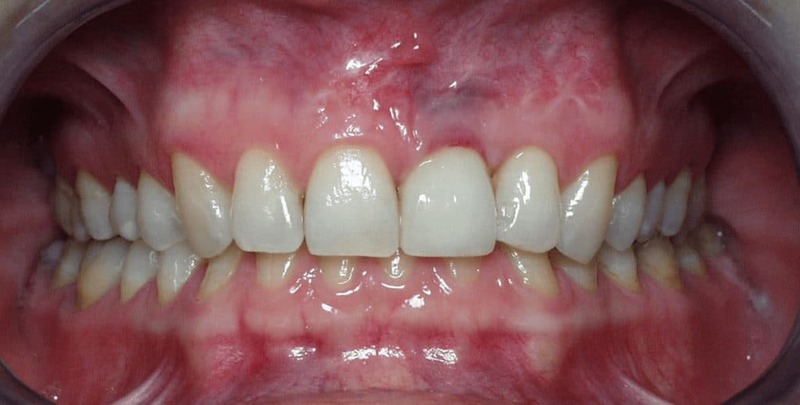 The bite is also checked to ensure that the implant and crown are not being overloaded. Thereafter, the implant should be checked on an annual basis primarily to ensure that the forces placed onto this restoration are in harmony with the rest of the mouth. The importance of these regular check ups cannot be over-emphasised, as treatment should not commence unless you are prepared to maintain the restoration.